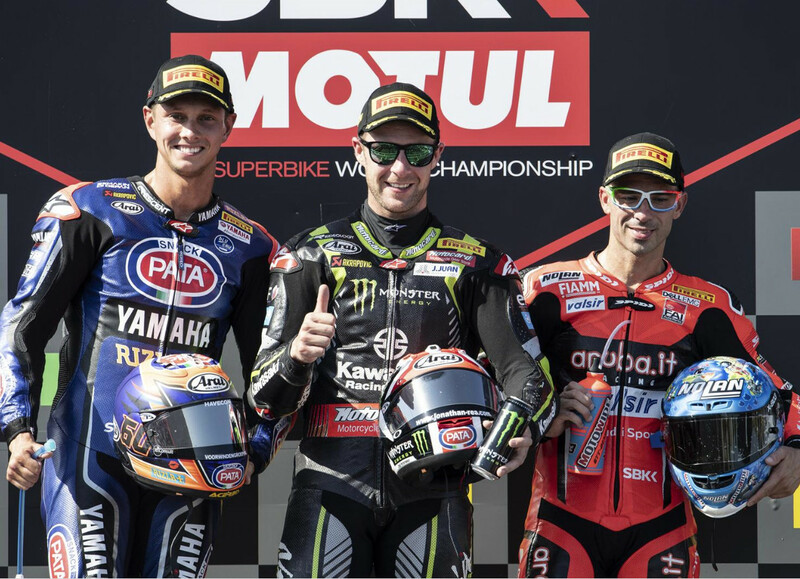 The unstoppable Jonathan Rea (Kawasaki) took yet another double win this weekend in Portugal. After his win on Saturday, Rea started Race 2 from ninth position on the grid, the standard grid penalty for the Race 1 winner. Unlike a relatively easy Race 1, it took Rea until lap 12 to work his way into the lead in Race 2. The podium ended up identical in both races, except that second and third place finishes were swapped between Marco Melandri (Ducati) and Michael van der Mark (Yamaha). The Ducati got home in second during Race 1, but van der Mark put his Yamaha into the second spot in Race 2. With three rounds (six races) left, Rea has a nearly insurmountable points lead, and is likely to take a record-setting fourth WSB title in a row. He can clinch the title during the next round in France. You will find full results for Race 1 here and Race 2 here. For additional details and points, visit the official WSB site. Wish I could watch it:) Comcast and BeIn had a fight and now it’s just gone. Might have to switch to a dish or streaming next year. They only gave us the Spanish version to begin with. Kind of ridiculous. Haven’t found a streaming service that gives us the Seattle Mariners though which we also need. I don’t really want to put a dish on the side of the house. ARGH! Congrats to Rea though, it is good to be a Kawasaki fan right now. Cant watch Moto GP. Can’t watch Moto America. Can’t watch WSB. At least I have F1 and Supercross. Sigh. I wonder how much Melandri gets paid to wear those dopey glasses. We need more creative ways to penalize Race 1 winners especially if it’s Rea. Maybe put him on a KLR650 or a Ninja 400 for Race 2. Maybe we can ask NASCAR what they think should be done to make the races more evenly matched. “Debris on the track! Yellow FLAG!! NASCAR is the WWE of motor racing..
Hmmm, win a race, and get penalized. That’s a new one for me. Glad he managed the win in race 2 just the same. The shrieking Kawasaki strikes again! Congratulations Jonathan, don’t let it go to your head though, races and championships can be lost that way.